The beauty of magnificently immersing nocturnal landscapes of Aragón region in northeastern Spain is resurrected once more! Max Corbacho, the Spanish driftscaper par excellence has released the second chapter of “Nocturnes” series during April 2018 through his Silentsun imprint. 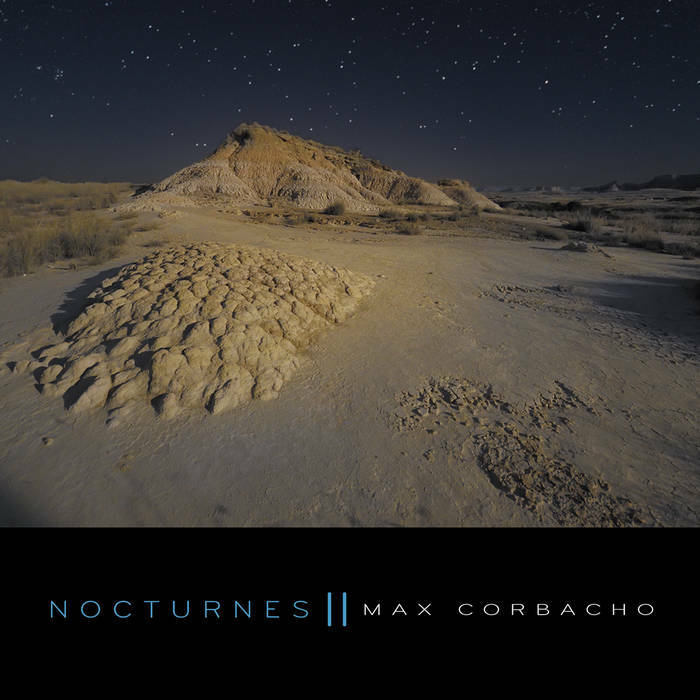 “Nocturnes II” CD is packaged in an attractive glossy 4-panel digipak, featuring original cover photographs by Max Corbacho with additional layout work by Michael Rodriguez Pletz. The opening “Celistia” track clocks over 23-minute mark and immediately takes the listener into awe-inspiring vastness, where undisputable, timelessly gliding and ebbing insignias of its sole purveyor meticulously coalesce with balmily glimmering nightly quietudes and inconspicuously permeating faunal symphonies. A journey through grandiosely barren horizons is fully unfolded, Max Corbacho again unlocks the gates to soulfully fascinating terra incognitas. Indeed, an epic listening experience awaits here! Shorter “Nocturnal Bloom” clandestinely soars into even more expansive grandness, a gracefully colossal realms owned by this Spaniard. It’s a pity not even a 4 minutes long ambrosial exploration is gone too fast. But no worries, almost 9-minute “Starlight Grace”, as indicated by its title, steals the splendor with all its panoptically prodigious monumentality, free-floating spatial solitariness is exquisitely juxtaposed with surges of titillatingly mindscaping reverberations. Tenaciously monstrous, pure magic!!! “Heart Of The Night” is another rather ephemeral odyssey, yet intensely engrossing, where all hues of organic tapestries persistently amalgamate with voluminously undulating magmatic stratums. “Indigo Sphinxes In Dark Canyon”, at 3:10 the shortest venture on the album, tightly keeps breathtaking tension of its predecessor, but an array of ear-bending piquant meridians steals the whole spectacle. I keep on delving deeply into staggeringly perplexing chasmal domains… “Timelapse” returns to relatively calmer terrains, but sonic metamorphosis seems to be unstoppable and surreptitiously nuanced scenario moves into a profoundly delightful monolithic vertex. Then through peaceful diminuendoing closing this spellbindingly transcendental circle. Big applaud, Maestro!!! 20-plus minutes long “Moon Apparition” delicately reveals the genius loci of these arid sceneries, where gracefully meandering panoramas of dronescapes precisely harmonize with genuinely shimmering nocturnal field recordings and transitorily trenchant climaxes. Tranquilly enveloping conclusion! No matter if entering enthrallingly overwhelming skylines, nebulously extraterrestrial spheres, mysteriously labyrinthine inner zones, spectacularly subaqueous depths or majestically monumental architectural masterpieces, Max Corbacho always delivers the very best of his virtuosic soundcarving, a rewardingly abundant momentum of tremendously sophisticated wizardry in sculpting powerfully transporting opuses. With gem like 70-minute “Nocturnes II”, but also with “Source Of Present”, “Nocturnes” and most especially with recently released “Horizon Matrix” (out since November 30th, 2018), Max Corbacho is triumphantly chasing quintessential milestones such as “Ars Lucis” and “The Ocean Inside”. Once again, bravo, Maestro!! !